The Zero G ankle foot orthosis (AFO) is a prefabricated, offloading brace that relieves plantar surface pressure from the foot. The Zero G AFO incorporates a supple, but strong, adjustable, calf corset with leather lacers and Velcro closures. This design provides a total-contact, hydrostatic lift of the inverted cone shape of the calf, providing up to 100 percent offloading of the foot. 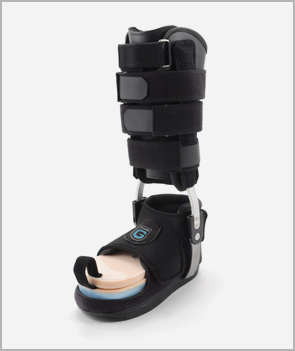 The Zero G brace’s patented design, with malleable metal uprights, provides a sturdy, stable substructure that transfers weight from the ground to the calf and not the foot and ankle, providing up to 100 percent non-weight bearing. 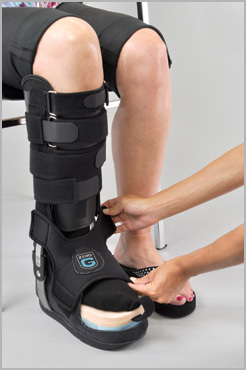 The Zero G AFO comes in two components, the calf lacer and the AFO base. Strap with easily adjustable Velcro closure system for ease of donning / doffing the brace. Anterior tongue protection to complete the 360-degree lacer. One SmartKnit® seam-free sock for soft interface. Infinitely adjustable leather lacer corset on the brace structure with Velcro fasteners. Half inch (½") donning pad to ensure a repeatable offloading process. Double-action ankle joints for assist / resist adjustment. One inch (1") memory foam foot pad to cushion any pressure applied to plantar surface of the foot. Footplate pad made from ¼" Plastazote. Adjustable, padded foot cover encases and protects the foot. Universal for left or right fitting. Measurements of the calf circumference and the foot length are taken to determine proper sizing. The Lacer and AFO Base sizes of the Zero G AFO can be interchanged for proper fit. To place an order, please call 800-466-7015, or fax order to 970-498-9529. © 2019 Certified Orthopedics, Inc. All rights reserved. Patent Pending.